Just a few weeks ago, we finally got to see Porsche’s answer to the BMW X6 and Mercedes-Benz GLE. The Cayenne Coupe is Porsche’s attempt to cash in on the coupe-SUV craze, and it’s arguably one of the best-looking models in the segment. At launch, the 2020 Cayenne Coupe will be available with its standard sibling’s 3.0-liter turbocharged V6 that generates 335 hp and 332 lb-ft of torque, while the range-topping Cayenne Turbo Coupe uses a 4.0-liter twin-turbo V8 that produces 541 hp and 567 lb-ft. of torque. In the future, there could also be a coupe version of the Cayenne’s smaller sibling, the Macan. As for the fully electric Macan, Porsche is still deciding which model names it should use. Applying the "Turbo” name to an electric car that doesn’t have a combustion engine with forced induction obviously doesn’t make sense, although the range-topping Taycan may still adopt the Turbo name to match the 911’s lineup. In addition, the electric Macan could spawn new body styles, including the aforementioned coupe version. 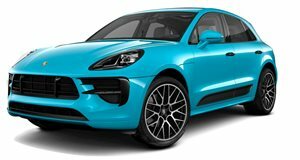 Porsche is also considering developing a Macan "with more space.” Steiner says these potential models are "interesting,” but it remains to be seen if either of them will get the green light for production. A coupe version of the Macan makes sense after the launch of the Cayenne Coupe, but the other possible model is a mystery for now. Steiner could have been referring to a long wheelbase version with extra legroom aimed at China, which is Porsche’s biggest market. The Macan is Porsche’s best-selling model, so offering more variants would generate big business for Porsche.